Cheesepocalypse? Say it isn't so! Home Retro Food and Recipes Deliciously Retro Cheesepocalypse? Say it isn’t so! I didn’t think anything of it when I clicked on #Velveeta–a trending topic on Twitter today. Needless to say, imagine my surprise when I learned that Kraft Foods has announced that there’s an honest-to-goodness Velveeta shortage. Me? I didn’t think such a thing was possible. I mean, not that I’m questioning the amount of actual cheese in Velveeta, but still, I like Velveeta. I know the soft cheese spread has its detractors, but, introduced to it late though I was, I’ve become a big fan. Although I grew up in New York, and Velveeta was invented in my old home state in 1908, I can’t remember ever having eaten it until after I met my wife. (I’m sure my Mom had some, in a container that dated back to 1959 or so, stored away in the back of the closet where she kept her ’emergency foods’, like SPAM, cans of corned beef hash and Dinty Moore stew). Pam broke it out to mix it with something called Rotel when we started living together, and that was pretty good. But then, we had our first big party, where Pam mixed a crock pot full of chopped meat (the good kind, you know–without all the fat removed?–some seasoning and, Velveeta. She bought Scoops chips, which made it easy to load ’em up with the concoction my Mom likes to refer to as: dog food, and voila! A new party staple was born. I’ve had Velveeta leftovers on other foods since. Burgers. Mac & processed-cheese-type-food. In a milkshake. Okay, so I made that last one up. But if ever I do decide to follow-through on an oft-made claim about wanting to make a peanut butter and cheese shake.? You know there’s going to be some Velveeta in there. 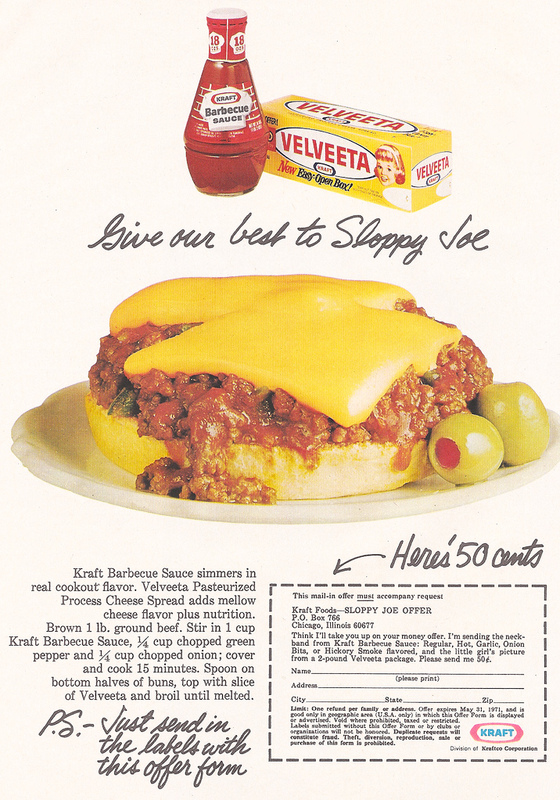 Kraft Foods bought the Velveeta Cheese Company in 1927, and turned it into a cheesy juggernaut. Though it remains popular today and is sold in a number of countries, I remember Velveeta being really big in the late ’70s and ’80s. It was a key component in any number of recipes, there was the TV jingle, and virtually every grocery store had a Velveeta display. Not having grown up eating Velveeta, I am making up for it now. The very notion of a Velveeta shortage with our Valentine’s Day party only three weeks away is quite unpleasant indeed. I’m not saying I’m going to be hoarding the stuff, but I’m not taking any chances. Tomorrow, I will be venturing out to our local supermarket, and tracking some down. If not there? Then the local Wal-Mart. If not there, then the hunt will be on until I secure some. I have partygoers who rely on us for that tasty meat and cheese and chips combo, after all. Letting them down is not an option.